Labor Secretary Calls Workers' Comp Opt-Out Plans A 'Pathway To Poverty' : The Two-Way The U.S. Department of Labor has begun investigating whether alternative plans to state workers' comp benefits are unfair to injured workers and violate federal law. Labor Secretary Thomas Perez, pictured in 2015, says, "If you get hurt on [the] job, you still should be able to put food on the table, and these laws are really undermining that basic bargain." Perez says the probe focuses on a practice by thousands of employers in Texas and Oklahoma to opt out of conventional state workers' compensation in favor of benefits plans that provide lower and fewer payments, make it more difficult to qualify for benefits, control access to doctors and limit independent appeals of benefits decisions. "What opt-out programs really are all about is enabling employers to reduce benefits," Perez says. Opt-out programs "create really a pathway to poverty for people who get injured on the job." Perez wouldn't provide any details. But last month, his agency sent a letter to Sen. Sherrod Brown, D-Ohio, disclosing "contact with the company cited in the ProPublica/National Public Radio report that is offering services to employers in Texas and Oklahoma" who opt out of workers' comp. That description fits PartnerSource, a Dallas company that wrote and supports almost all opt-out plans in Oklahoma and about half the plans in Texas. An agency official, who declined to be named because he is not authorized to speak publicly, confirmed that PartnerSource plans are the focus of the investigation. PartnerSource President Bill Minick has not responded to NPR's requests for comment about the probe. For decades, Texas employers have been able to forgo workers' comp and its state-mandated benefits and regulations. Oklahoma employers began opting out in 2014. Minick has said he is trying to export the concept to a dozen states in the next decade. The two states combined have 1.5 million workers covered by these alternative plans instead of state-regulated workers' comp. 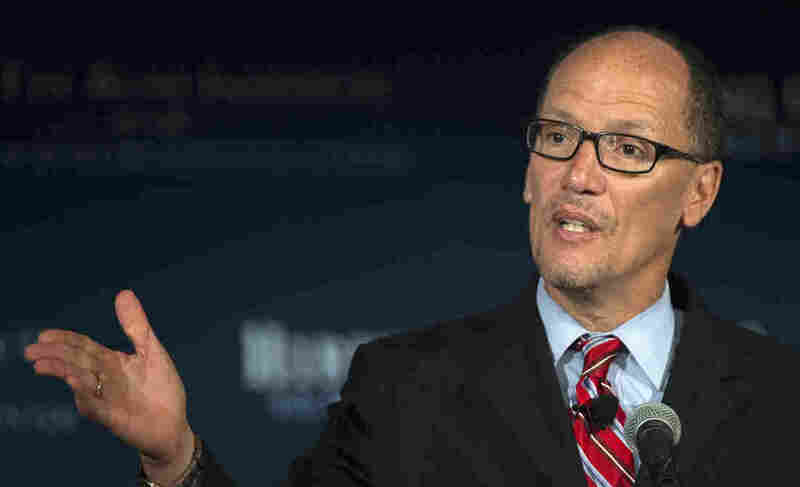 "If you work in a full-time job, you ought to be able to put food on the table," Perez says. "If you get hurt on that job, you still should be able to put food on the table, and these laws are really undermining that basic bargain." Perez cautions that the Labor Department has limited authority to respond because workers' comp is a state-run program. The agency can't force employers to match state workers' comp benefits when they opt out of state systems, he says. But in both Oklahoma and Texas, and in other states that have considered opt-out laws, Minick and employers say that opt-out plans are governed by the federal Employee Retirement Income Security Act, or ERISA. ERISA is regulated by the Labor Department, and the agency's investigation focuses on whether employers are violating ERISA with plans that restrict access to benefits. Perez cited plans that require mandatory arbitration for benefits disputes as an example. "Mandatory arbitration clauses I think more often than not work to the detriment of working people," Perez says. He also cited plans that force workers to report injuries before the end of their shifts or within 24 hours, which "ends up being used by companies to deny all benefits," Perez says. Last month, the agency sued U.S. Steel for suspending workers (in a non-opt-out state) who failed to report injuries immediately. The lawsuit argues that some injuries, like those involving muscles and soft tissue, are not immediately apparent or serious. Perez says the Labor Department has the authority to make sure that employers who opt out of workers' comp "have important procedural safeguards" required by ERISA. If violations are found, he says, the agency could demand procedural corrections, but employers would still be able to provide fewer benefits. A striking example is a new rule Perez touted Thursday that severely limits worker exposure to silica dust. But most of the opt-out plans obtained and reviewed by NPR and ProPublica specifically exclude medical benefits for specific occupational diseases, including silicosis. "That is my frustration," Perez says. "I wish under ERISA that we had more authority to do more things." Minick says opt out forces workers to take more responsibility for workplace safety, provides treatment more quickly, avoids protracted and expensive litigation and cuts costs. Last week, Stanford law professor Alison Morantz reported that a sampling of large Texas companies that bypassed the state workers' comp system reduced worker injury costs by 44 percent after shifting to alternative plans. Morantz said her study did not measure whether workers were better off under the plans or whether the cost savings came at their expense. "Some employees clearly fare worse," Morantz wrote. Perez says the Labor Department is commissioning a report about the opt-out trend and cutbacks in workers' comp benefits "to document the precise nature of this problem across the country."